Horticulture is the area of study that combines the art, science, technology, and business of growing plants. The bases of the program are botany, biology, chemistry and soil science. With these “building blocks” students study ornamental plants, foods and other useful plants, and flower production- how they grow and how to keep them pest and disease free. 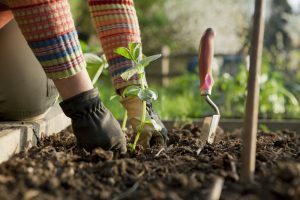 This program places great value on hands-on practice, so students should expect to get a little dirty, designing and installing landscape and garden features, managing the greenhouses and helping out with the campus farm and composting operations. Involvement in horticulture also allows for quite a bit of creativity, because bringing beautiful designs to life requires both scientific and artistic understanding. A special feature of the Horticulture program is the annual Philadelphia International Flower Show, where students are involved in all aspects of putting together a major exhibit, from development of the concept to actually bringing it to life on the Convention Center floor! Students in this program will have a great foundation for building careers in numerous areas, including business (landscape contracting & design, retail floristry, etc,) conservation biology, wellness (horticultural therapy,) food production and research.